Don't you feel more cheerful, well rested and motivated, already? Maybe you won't even need that extra cup of coffee. Perhaps you should start a new exercise routine... Who's up for climbing Mount Everest???! Ok, let's take it one step at a time, shall we? 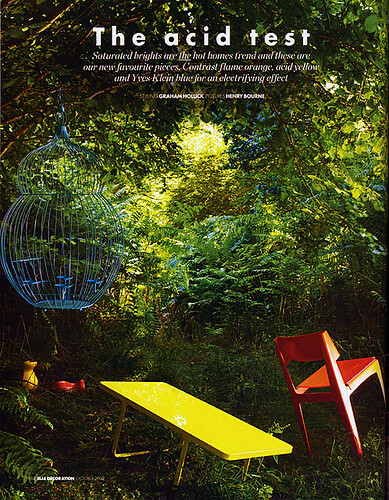 Or maybe, like Karly, you've been craving some sunshine in your space. 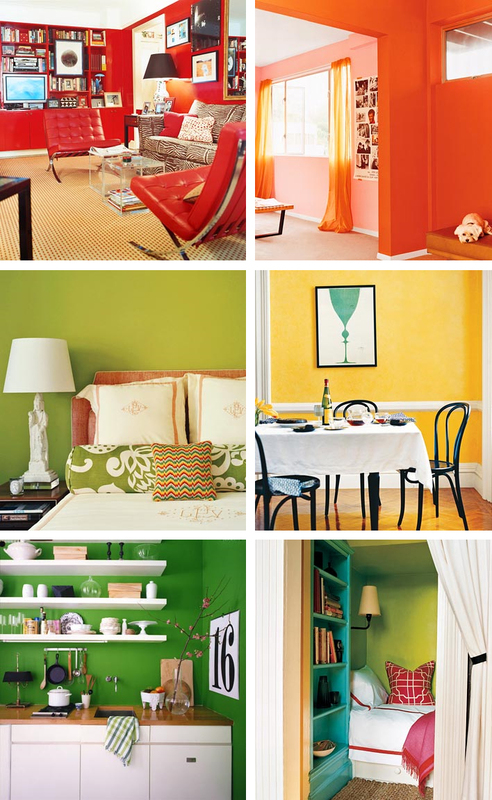 Why not go for a zany shade of yellow on the walls? 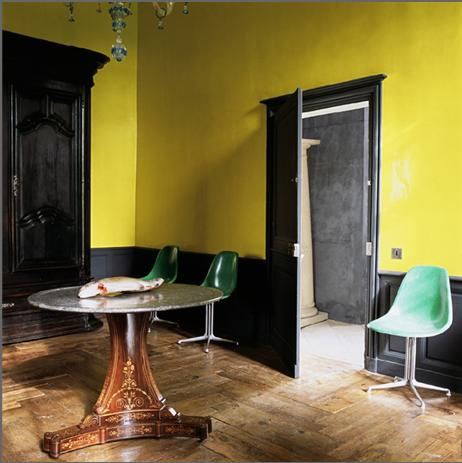 I love the super bright funkadelic yellow paired with dark dark trim and subdued, weathered floors. Shall we just say that the dead fish on the table adds to the rustic charm? Yes, we shall. Those chairs are pretty boss, too. 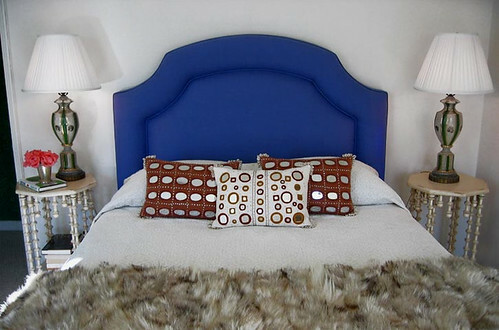 For those of you who love color but want something a little more sober, why not a bold, cobalt blue? It's much more unexpected than the usual aqua tinged walls, but still restful enough to catch some much needed Zzzzzz's at night. A silver leafed ceiling could be a magical complement (and gold is always fab). Or perhaps you prefer to just scramble the whole color palette together and have a delicious rainbow omelette? 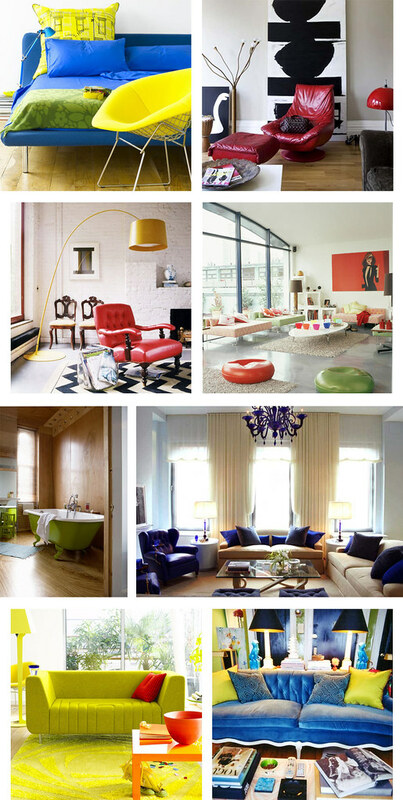 This whole house decorated by M. Design Interiors is a madcap acid trip fantasyland, and I really want to live there. 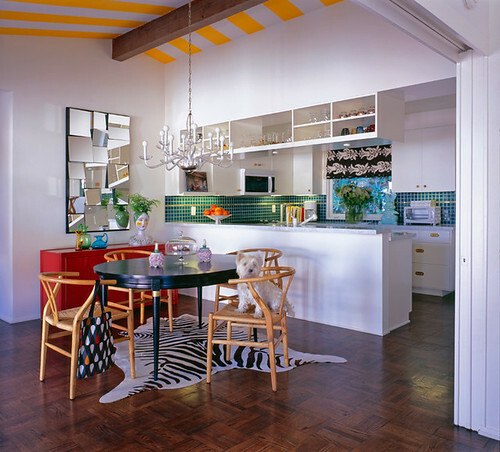 The sleek furnishings and square lines have an awesome 70's vibe, so perhaps we should throw a hip blogger's disco party? I think I'd have to ditch the tulips, though. 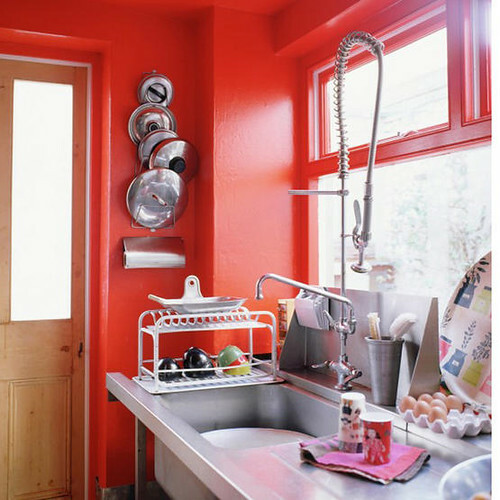 If you're not into all out color, maybe just a peep of bright paint would do the trick. I love the use of primary shades in this super white space, courtesy once again of the fabulous M. Design Interiors. Ok, I know that lots of you out there love color, but would prefer to confine it to accessories and furnishings for a splash of bright something something against a neutral background without the commitment of paint. Here are some renter friendly solutions that will still give your pad some punch. Why not reupholster a vintage couch or chair in a shockingly bright fabric to create a substantial focal point in your otherwise neutral room? Or you could always do some super mod pillows for a cheap and easy burst of color (bonus points for resourcefulness if you can sew your own). Also, I kind of want a lime green clawfoot tub now... If only I had a bathroom big enough for one! Anyone want a cush headboard fit for a princess in a color that won't make your prince cringe? Yeah, baby, I can dig it. Now how about a red green combo that's miles away from Christmas? 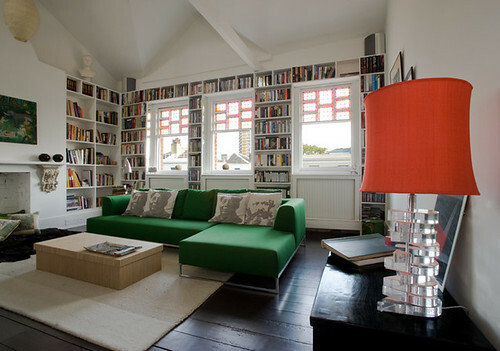 That is one delicious lampshade, and I love the repeat of the color on the window frames. Is that an Ikea couch? If not, they have a very similar version that comes with a zillion different slipcovers, so you can redecorate annually without breaking the bank. I am voting for new pillows though. How about a row of Obama heads instead of Mao and Marx? Yes we can. If you already have great bones, highlight them. 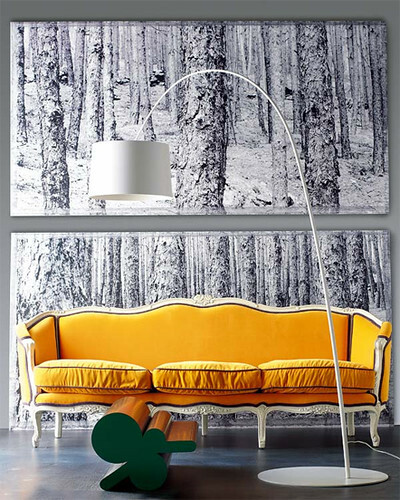 A burst of sunny yellow makes this old school stunner look fresh, clean and modern. How much do you love the charcoal piping? Fabulous. 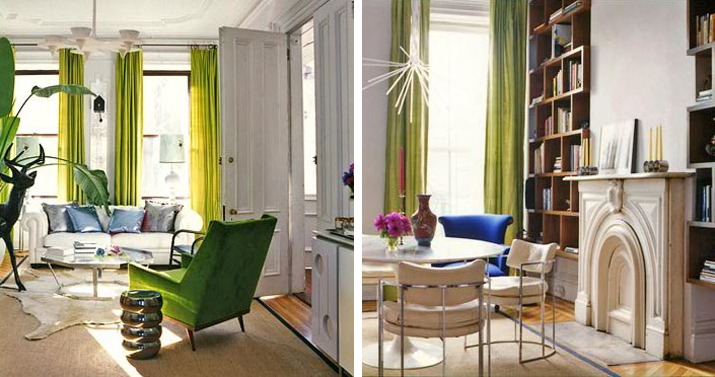 Even bold color can be subtly softened by its surroundings. Purpley gray walls set this versatile tomato red couch afire, but an otherwise subdued color palette keeps things cool and sophisticated. I really hate barstools, but at least these are camoflaged by a similarly hued tangerine kitchen bar with matching countertops. 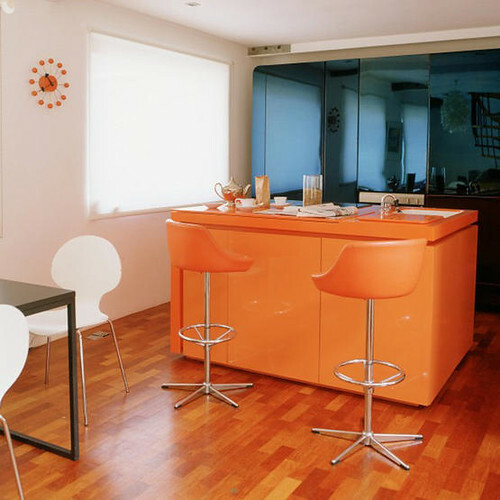 I love the harmony with the orangey wooden floors, as well as the contrast with the blue mirrored glass in the background. If you've never checked out the Brooklyn home of Fawn Galli, go there now. 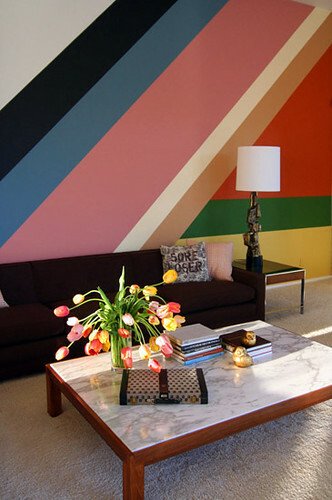 Her house is a gorgeous reminder that color is fun and doesn't have to be opressive or vulgar. And she has a giant deer sculpture. My hero. That's it for this Sanders-inspired roundup of ultra ultra brights. What do you think? Could you live with these acid hues, or are you planning to stick to neutral basics? Tell us all about it.